Fall of Cybertron continues the amazing tradition brought by its predecessor and makes it better, even if a few things take a step back. Two years ago, fans of robots-in-disguise collectively groaned when they learned that High Moon Studios was working on a Transformers game. You see, there hadn’t been a good game based on the long-running franchise in…well…ever. 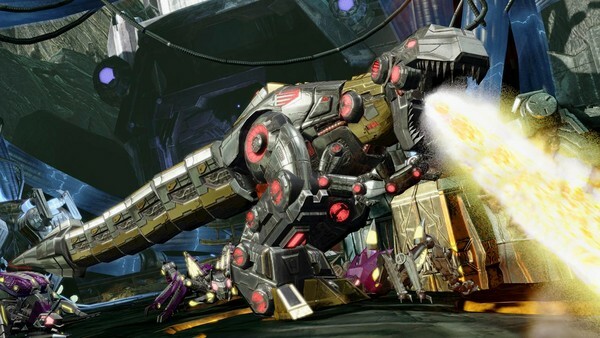 Much to our surprise, Transformers: War for Cybertron was actually really freakin’ cool. When a sequel was announced at the Video Game Awards last year, High Moon could do no wrong. 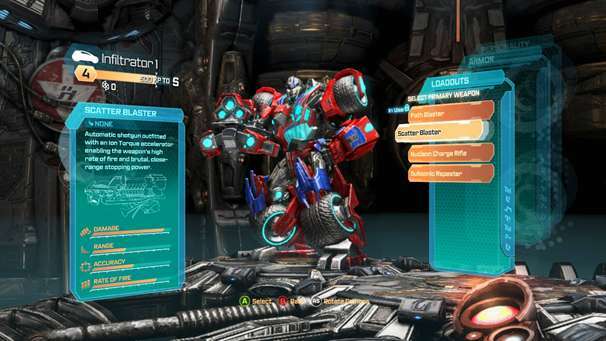 Aside from a few odd missteps, they’ve made an already amazing game even better with Transformers: Fall of Cybertron. You see, part of what makes the Cybertron games so great is the same reason that the Arkham games were such great Batman games. The game wasn’t rushed to coincide with some release date of a corresponding movie. No, the development team was free to do as they please in the universe they’re given. And boy what a game they’ve thought up. Anyone who knows anything about Transformers lore knows how the game ends already. 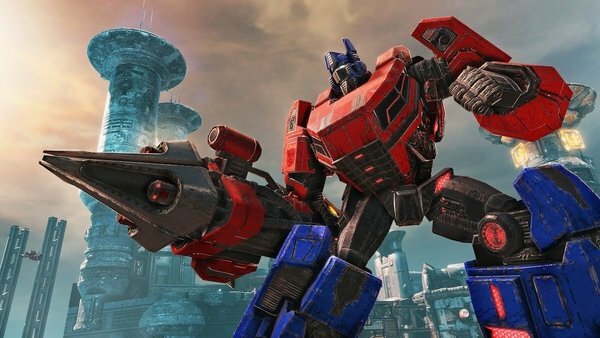 After all, like the golden era between Episodes III and IV in the Star Wars saga, the Cybertron games exist only to provide the backstory to what would become the entire Transformers franchise. We already know that the Transformers land on Earth, where their battle continues amongst the human race. However, the events leading up to this have never really been explored, and it’s really cool to see what High Moon has come up with. The story is nothing to write home about for the average gamer, but fans of the series will nerd out over every line of dialogue. I smiled when Megatron and Starscream had one of their trademark fights. Hearing Gregg Berger reprise his role as the voice of Grimlock after so many years nearly put me in a nostalgia-fueled coma. Let’s get one thing straight, this is a game built as a love letter to the franchise, and appeals most to fans. Even the credits, which features the staple song The Touch by Stan Bush from the 1984 movie will make fans feel like children again. 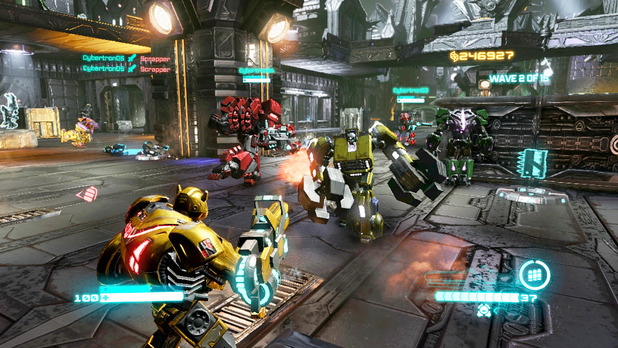 Aside from being the most uniquely themed third-person shooter of all time, Fall of Cybertron brings about diversity to the level design. The first game saw a lot of linearity and set pieces. Whereas the new game still has much of that, but some levels are structured so you can freely roam about instead of just following instructions. This is meant to put more emphasis on the fact that your characters can transform into Cybertronian trucks or cars or planes or bugs. The downside of the campaign comes with a bit less substance. The previous game had a nearly full campaign for each the Autobots and the Decepticons. This one, however, switches back and forth depending on what’s going on in the story, and each chapter gets its own focus character like Optimus Prime, Megatron, Cliffjumper and of course the almighty Bruticus and Grimlock. This also means that the campaign is much shorter than the original game, clocking in at about 6-8 hours depending on your difficulty level. Don’t get me wrong, the game is great from start to finish, and believe it or not I’m actually quite comfortable about the length. But I know the relatively short time investment might not be worth the price of admission to some. This also means that the co-op campaign, one of the best parts of the first game, is mysteriously gone. Sure, the story makes it all seem like co-op wouldn’t fit, as you’re more alone this time around as opposed to having AI teammates available in the first game, but it would have been really nice to have. There were a handful of ways that co-op could have easily been added in without sacrificing the integrity of the story. I AM a little disappointed at the pacing of the story, though. Chapters 1-6 seem about right, but from seven on are all varying degrees of length. A few of them are seriously only about 10 minutes, with a few of them varying in length from half an hour to two hours. It’s a little ridiculous, but as I said, I’m happy with the length of the game. I feel like if there was any more game that I would have gotten burnt out from it. Thankfully, it’s not all cutting for the game. New to the series is the TELETRAAN upgrade system. Aside from your typical audio logs shedding some light on the background of the game, you’ll also find blueprints scattered about the levels. These unlock new weapons to access in TELETRAAN. This system acts as your weapon and ability upgrade system. With each weapon unlocked, you have the option of purchasing attachments with shards dropped from fallen foes. These upgrades might increase accuracy, they might add some extra ammo, they might eliminate recoil completely, they might increase your armor when in vehicle mode, they might do a host of other helpful things. It’s a great way to make the player go out of their way to make sure they get every last enemy instead of simply running past them, and it also promotes exploration a bit better than simply hiding random stuff in dark corners. The TELETRAAN also features a little thing that I didn’t even know I wanted. If connected to the Internet, you can actually rate how useful guns and upgrades are, and you can also view what the community has rated everything to know if it’s something you should spend your hard-earned shards on or not. It’s also worth noting that the game looks and sounds much more impressive than the last game did. High Moon took special care to make sure there’s more color around things. That things don’t look so bland as they did in the first game, which was marred by an endless sea of shiny gray metal. There were also a handful of times where I actually thought the soundtrack was really powerful, which was odd given that Transformers isn’t a franchise known very notably for epic sound. Maybe the occasional 80s rock hit by Stan Bush, but epic battle music? Orchestra mixed with techno that I don’t hate? I can dig this. Although, I think it’s odd that the one game I expected to be littered with dubstep seems to have none of it. Missed opportunity, High Moon. It’s okay. I still love you. Thankfully, bringing the replay value back up are the co-op and multiplayer modes included in the game. Escalation, the survival mode from the first game, returns as brutal as ever. There’s a good reason that you’re basically forced to play this with other people. It’s really freakin’ hard, but that’s what makes it so great. The thrill of you and your friends conquering wave after wave of ruthless enemies is incredibly satisfying. Moreso considering that the TELETRAAN system carries over from the campaign to help you gain that extra boost of power on your way to defeating all 15 waves. Previously, you could only use earned shards to unlock new areas of a map. Now it’s much more useful than that with purchasing weapons and upgrades. Backing that up is the surprisingly robust multiplayer mode. Amongst your four gametypes – Team Deathmatch, Capture the Flag, Conquest and Head Hunter – you’ll find that the maps are much larger and open. This is also to allow players to have a little bit more fun with vehicle modes and adding new ways to strategize. It was incredibly annoying to be a jet-based robot in the first game due to the confined spaces. Not great for flying. Not anymore! What makes the multiplayer mode so addictive is the robust customization aspect. Sure, you could change the colors and pick a few weapons for your four different classes in the first game, but that’s child’s play compared to the new system. Each of the four classes – the quick infiltrator, the balanced destroyer, the powerful titan and the useful scientist – are incredibly focused now to each fit their own needs. No more running and gunning here, you’ll actually need to have a fair balance of the four classes in order to be successful. Not only that, but your aesthetics are overhauled too. With shards you earn in multiplayer matches, you can unlock new parts and weapons for your fighters. This means you can simply pick predetermined character models should you so choose, but players can now create their own Frankestein Transformers. Give your destroyer the head of Optimus Prime, the arms of Onslaught, the chest of Soundwave and watch as you see hundreds of seriously personalized robots-in-disguise as you jump online. And of course, your weapon and skill selection carries over from the massive amount of options from the campaign as well, meaning your multiplayer characters are actually you, not just a different color of your favorite Transformer with two guns that sorta look okay. Everything this game has to offer is pure, unfiltered awesome. From the campaign that will have you on the edge of your seat the entire time, to the endless amounts of hours you’ll spend slaughtering anonymous Cybertronians online, this is a game that I know I’ll be popping back in for years to come. It may be the blind nostalgia talking, and then so be it. And if it is the nostalgia talking, then that should speak volumes for the audience that Transformers: Fall of Cybertron caters to. Fans. Fans both young and old from all walks of life that have had a brush with Transformers outside of Michael Bay’s terrible movies. 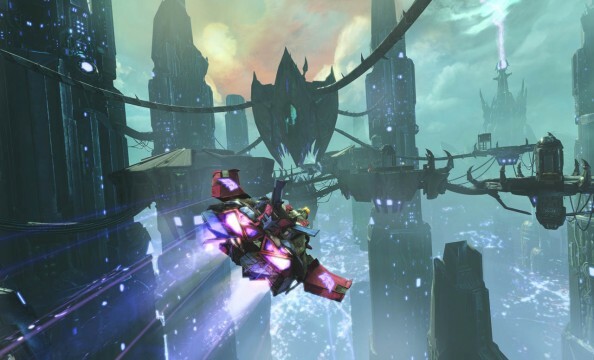 Those who aren’t as well versed with the Transformers universe might not find the game quite as valuable, but should still find some enjoyment here. This is the game that’s the technological representation of when we were all kids bashing old Transformers toys together while we were imitating last week’s episode on our bedroom floors. High Moon has taken Transformers and made the franchise grow up with the fans who’ve put so much time, effort and money into the franchise in the first place. And it works. But seriously, I’m still waiting on a Beast Wars game.